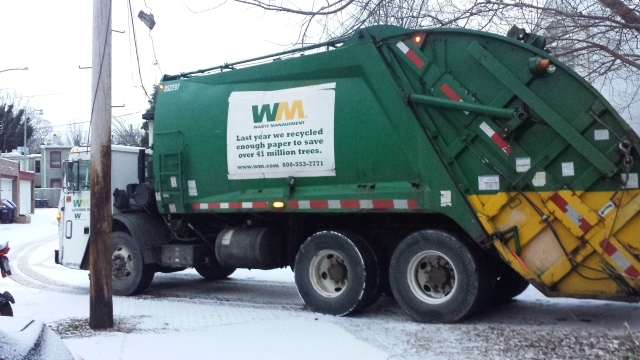 This morning I had an incident that I thought should be shared with anyone in DC who uses Waste Management (WM) as their private trash pick-up service. The apartment complex next to ours uses it, so it wasn’t a surprise that the truck was pulling in to our back alley this morning as I was about to leave. To get to the neighbor’s driveway requires blocking ours (with a few others) so I hung around the back door to stay warm while they did their thing. After several minutes, I realized no one had gotten out and the truck was still in the same stationary spot. My over-active imagination got the best of me. I started to wonder if at some point I just didn’t notice the driver get out and he had slipped and fallen on the other side of the truck or had a heart attack before he could get out. I woke up my boyfriend (he has a bit of medical training) but as we both walked all around the truck and noticed there were no footprints, we discovered the answer was much more simple (it usually is, isn’t it?) – the driver had slouched down and fallen asleep. My boyfriend asked him to move it elsewhere which I guess offended the driver because he moved to the alley driveway and sat for several minutes. Finally, he very slowly made his way down to take a no-less-than-60 point turn to get onto the street. We’re in Capitol Hill NE so it’s not an easy area, but I encounter either the DC or private trash pick-up trucks 3 mornings per week and it’s never taken nearly that long, so he was either overdoing it or extremely unexperienced. The snow on the streets had melted by then and there was no ice, so no excuse there.